The east sides of major UK cities such as London and Manchester have historically been the poorest due to industrial pollution. This has resulted in unequal distribution of social classes across cities that is still evident today. This is the main finding of research carried out by economists from the University of Bristol in collaboration with the University of St Andrews. The research provides insights into some long-term costs of pollution, and informs policy makers of the potential benefits of active environmental regulation to shape pollution exposure in cities (such as pollution permits) and possible urban policies to alleviate the effects of pollution (such as targeted urban investment to revitalise affected neighbourhoods). Dr Stephan Heblich and Dr Yanos Zylberberg from Bristol’s School of Economics, Finance and Management focussed their research on Victorian England, and created precise air pollution map reconstructions for 70 industrial cities and 5,000 industrial chimneys, including Bristol, Birmingham, Liverpool, Sheffield, Bradford, Bristol, Cardiff, Leeds, Leicester, Newcastle-upon-Tyne, Nottingham, Plymouth and York. They analysed data from 1817, before coal became the major source of energy, and data from 1881, around the peak time of coal use. The incidence of social deprivation was found to be 15 per cent greater in east sides than in west. Having established that pollution caused historical neighbourhood sorting, they then focussed on the period between 1971 and 2011, when pollution from coal burning declined abruptly. During the Industrial Revolution, areas of many cities in the Northern Hemisphere were covered with layers of soot produced by coal-burning factories and blown from west to east by prevailing winds, known as The Westerlies. East sides were sporadically covered under dark smog, which rendered them unpleasant places in which to live. Those people who could afford to do so, moved to neighbourhoods unaffected by pollution. 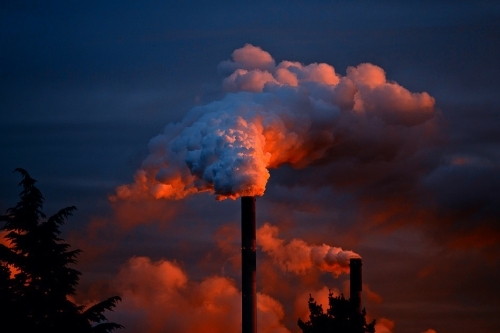 The researchers were surprised to discover that even after this sharp decline in industrial pollution, formerly polluted neighbourhoods in cities such as Manchester still remain the poor parts of town today, with marked differences in schooling outcomes and crime incidence. “Our reconstructions were made possible due to the fastidiousness of Victorian mapmakers, who carefully marked every building with details such as chimneys, and conducted precise population studies,” said Dr Yanos Zylberberg. Dr Heblich added: “The heavy reliance on coal between 1850 and 1950 generated unprecedented concentrations of sulphur dioxide, which scarred cities and their surroundings. The unequal distribution of pollution exposure thus induced a sorting process which left the middle and upper class in the relatively less polluted neighbourhoods. Heblich and Zylberberg also identified a ‘tipping point’: in neighbourhoods where past pollution levels were close to the city average, social segregation disappeared between the Clean Air Acts and today. In contrast, in neighbourhoods where past pollution was well above the city average, social segregation remained. The researchers say their work could have implications for the design of environmental and urban policies for economies such as China, as it undergoes structural transformation. The research findings have been presented at conferences, seminars and workshops, including at the Royal Economic Society, University of Cambridge, London School of Economics, St Andrews University and the Federal Reserve Bank of Philadelphia.